I don’t often get too serious on this blog – but sometimes, something serious comes along that I really feel compelled to write about. This is one of those times! The charity ShelterBox recently asked if I would join in with their new campaign ‘Shine For ShelterBox’, and I was more than happy to get involved. ShelterBox are a fantastic charity who provide aid to families in some of the world’s hardest-to-reach places and most devastated natural disaster zones. There are now 60 million people in the world who have been forced from their homes due to natural disasters and conflict – the highest number since WW2. In the past couple of months, amongst other places, ShelterBox have been providing aid boxes to people in Haiti, following Hurricane Matthew, and in Italy, following the series of recent earthquakes. ShelterBox provide family-sized tents to the people who really need them, as well as cooking sets, solar lights, water purification equipment, thermal blankets, and more. The ‘Shine for ShelterBox’ campaign encourages people to hold candlelit meals with their friends and family, in order to raise money to brighten lives around the world. I think it’s a brilliant idea – I’m sure most of us would welcome any opportunity to feast with friends, and knowing that you’re helping to bring a little bit of light to someone else’s life, both metaphorically and literally, is a great reason to get involved. If you’re interested in getting involved, you can request your free Shine for ShelterBox kit here, which contains everything you’ll need to host your own candlelit feast. Or, if you’d prefer for someone else to do the cooking for you, there are several fundraising pop-up events happening all over the country. And of course, you can also donate directly. When I was planning my own Shine for ShelterBox feast, my mind immediately went to comfort food – something hearty and warming, which can be easily shared with friends. My mum’s beef stew is perfect. 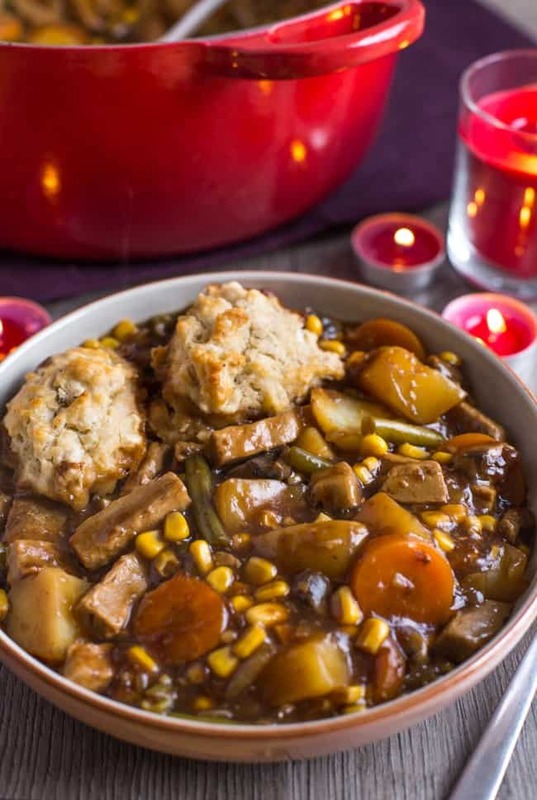 Of course, ever since I went vegetarian about 18 years ago, she’s been making a vegetarian ‘beef’ stew instead – sometimes with vegetarian mince, and sometimes with vegetarian beef-style pieces. This time I went for chunky pieces, but either way works well. 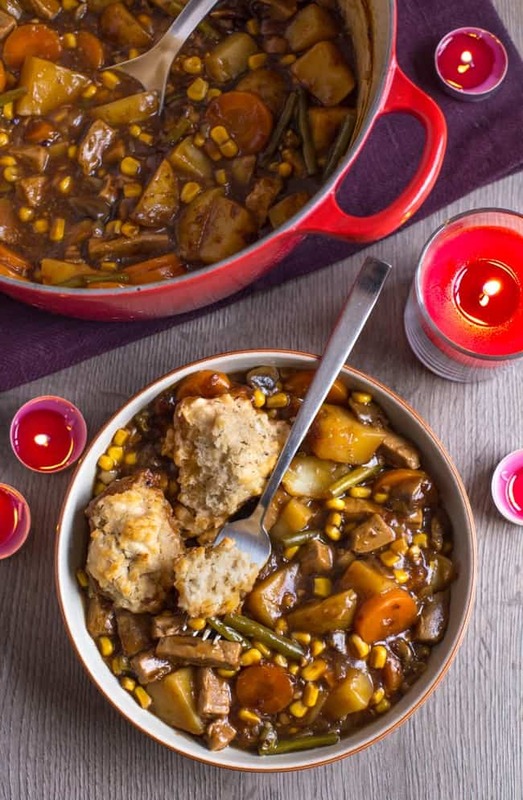 Two things make this vegetarian ‘beef’ stew amazing – firstly, the gravy. I know it’s not exactly cooking from scratch, but you need to use Bisto gravy granules (this is an authentic recipe from a British mum, haha). If you can’t buy them where you live, you can get them online*. Just look at the reviews! You really can’t beat them. This is the stuff I was brought up on. 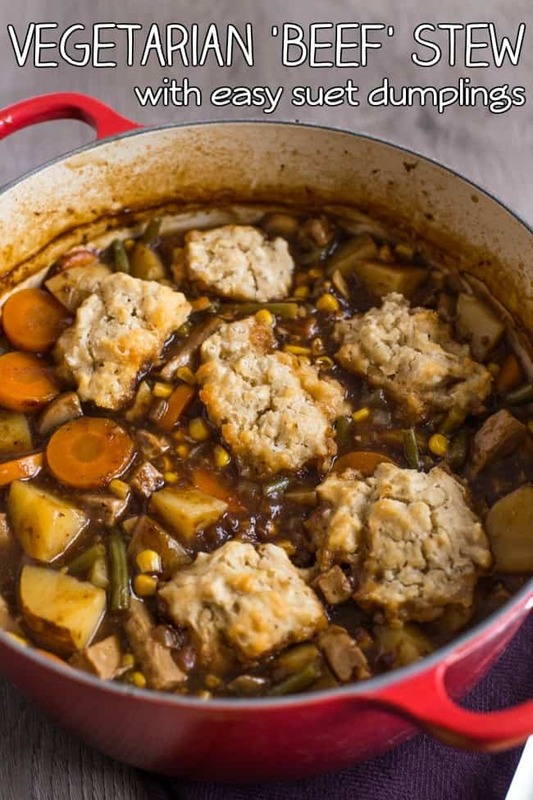 The second most amazing thing about this stew is the dumplings, made with vegetable suet*. They’re so easy to make – literally three ingredients (plus a bit of seasoning), one bowl, and about one minute. And they’re soooo good. 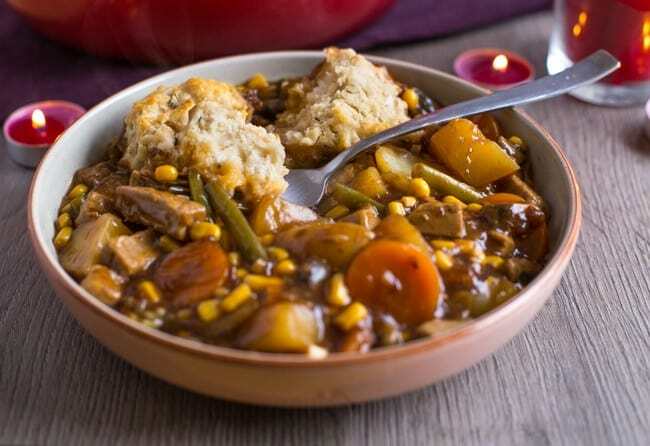 I imagine they might not be everyone’s cup of tea, but if you like a good bit of stodge (which I really, really do), they’re the perfect accompaniment to the rich ‘beef’ stew. Other than that, you can make this stew your own – use whatever veggies you like. My only warning is to use veggies that get better the longer they cook. 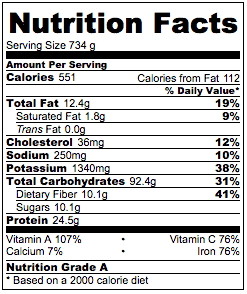 I wouldn’t use broccoli, for example – overcooked broccoli is nobody’s friend. Parsnip, sweet potato and leeks all work really well. If you’re inspired to hold your own Shine for ShelterBox candlelit dinner, don’t forget to request your free kit here, and get feasting! Heat the oil in a large casserole dish or very large oven-proof saucepan, and add the onion and beef-style pieces. Cook for a few minutes over a medium heat, until the onion has softened slightly. Then add all of the remaining stew ingredients (not the dumpling ingredients), and mix well. The liquid should reach to about the same level as the vegetables - add an extra dash of water if needed. Cover the pan, and place in the oven. Cook for around an hour, stirring once halfway, until the vegetables are all cooked. To make the dumplings, combine the vegetable suet and self-raising flour in a bowl, along with the dried oregano and plenty of salt and pepper.. Add enough water to bring the mixture together into a wet dough - about 150ml is probably about right, but you might need a little more or a little less. The mixture should be fairly wet and sticky. Dollop the dumpling mixture on top of the stew - I made around 10 dumplings in total, but you can make them larger if you like. Return the pan to the oven for a further 15-20 minutes. Cook uncovered for a crispy dumpling, or leave the lid on for a softer dumpling. The dumplings are cooked when they are firm and a knife comes out clean. Remove the dumplings from the stew, and stir thoroughly. If the stew looks a little thin, add another couple of spoonfuls of gravy granules, and stir well. Repeat until the stew reaches your desired consistency, and serve hot. 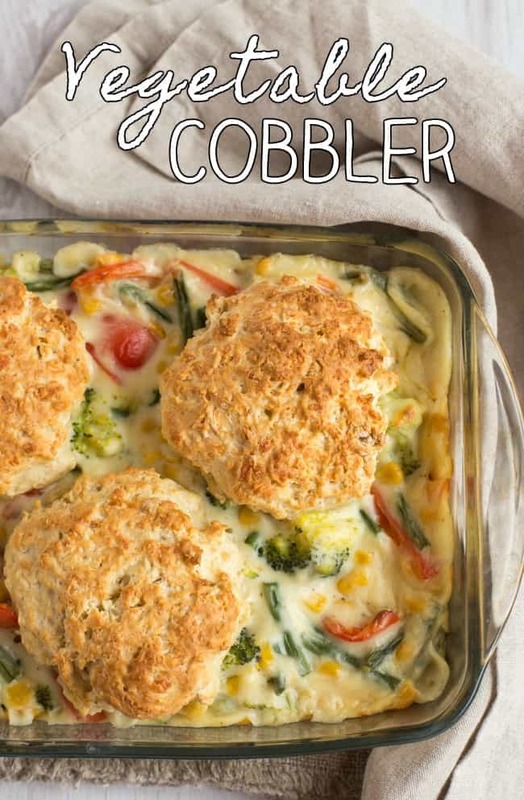 Here’s another old family recipe that’s a real winter warmer: vegetable cobbler! * This is a sponsored post, but since ShelterBox are such a fantastic charity, I wrote this post for nearly half of my usual fee. I will also be donating a portion of the fee straight back into the Shine for ShelterBox campaign. * This post contains two affiliate links. If you click these links and make a purchase, I will receive a tiny, tiny payment, at no extra cost to you. Thanks for the support! Next Post » 5 year blog birthday – Q+A video! I’m sitting here shivering a little and thinking about lunch. This sounds amazing. Oh for a bowl of that right now! Shine for shelter box sounds like a lovely campaign, What a wonderful idea to host candle lit feast and make a difference to other peoples lives at the same time. 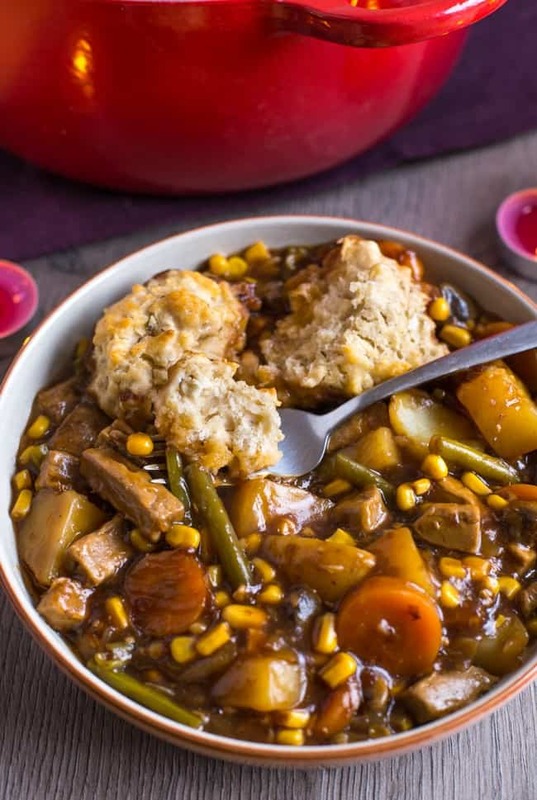 Your stew looks hearty and delicious and perfect for this cold weather. Thanks Nayna, it really is a fantastic charity. I just saw “beef stew” and panicked. Luckily, I hung on in there because a) it’s a fab recipe and b) Shelterbox is well worth supporting. This looks wonderful! Love vegetarian soups, and it looks so hearty! Yum! Love the idea of the ShelterBox charity. Your stew looks wonderful. Love the color and addition of the dumplings. Perfect for the cold weather lately. My gracious! What and attractive, delicious looking and sounding stew that you have there. The biscuits push it over the top, for me! Oh lady you are in direct communication with my stomach somehow! This looks SO good and I’ve not had proper stew and dumplings since I was little before I went veggie. Definitely going to try this! So loving the idea behind the Shine for ShelterBox campaign. I wasn’t aware of Shelterbox and have to check them out – they remind me of one of my favorite organizations Care – that helped out a ton when the tsunami went through Sri Lanka. 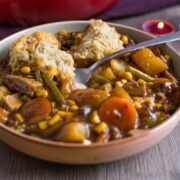 By the way, this stew looks so hearty and comforting and scrumptious! Thanks Shashi! They’re a brilliant charity – you should definitely check them out. What a lush veggie recipe and a wonderful idea too… love campaigns like this that make you stop and think, it’s really powerful. This stew looks absolutely gorgeous. 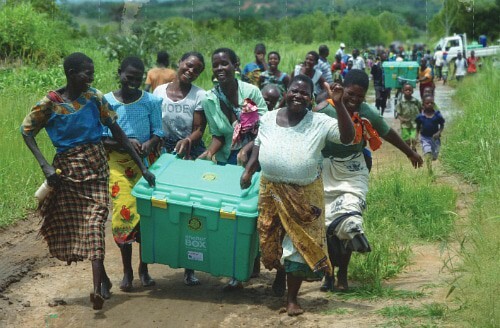 I agree that ShelterBox’s work is so important and I completely support them as well. Off to take a look at the candlelight campaign. I love stews, they are perfect for this kind of weather. We usually make one with string beans and it turns out very nice but this recipe sounds far more interesting with the corn kernels and the potatoes. Must be very filling! Yes it’s really hearty :) Would love to see your string bean stew recipe!